Hello everyone! This holiday season I’m honored and excited to be one of a group of 12 authors who have come together to offer you up some great reading. 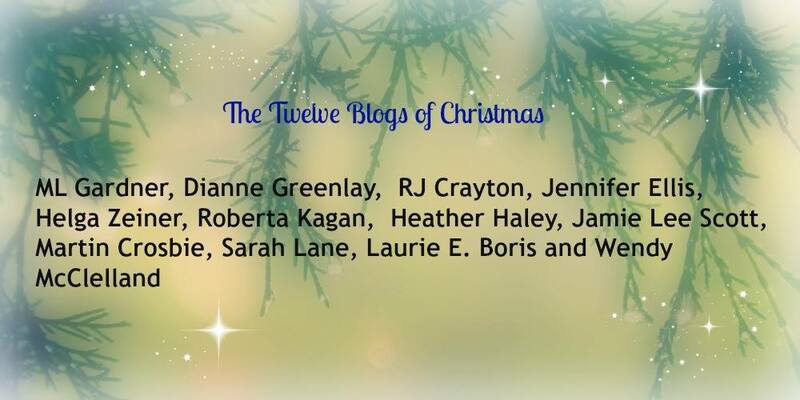 This special project, titled “The12 Blogs of Christmas”, has been organized by my friend and best selling author, Martin Crosbie. Here’s how it works: between now and Christmas, each day we will be hosting and posting a different bio, author picture, and a blog post from one of this group of very talented and hand-picked authors: R.J. Crayton, Jamie Lee Scott, Heather Haley, Jennifer Ellis, Helga Zeiner, Laurie Boris, M,L. Gardner, Roberta Kagan, Sarah Lane, and Wendy McClelland, and Martin Crosbie. I know! What a fab group, right? So here is my contribution. Thanks for dropping by! To steal that popular line, it is Hot Stuff Hubby’s summation of what he also refers to as “a Hallmark Holiday”. The rest of us call it Christmas. For anyone who has anything for sale, the Christmas retail season is like bottled oxygen to an astronaut in a Space Station – absolutely necessary in order to survive the rest of the year. Not a particularly religious man, Hot Stuff nevertheless laments the overshadowing of the original intent of fellowship and gratitude of the season, with that of a glut of retail activity. Personally, I love the hustle and bustle of the Christmas season. I think I must have been a magpie in a former life because I love all things sparkly – twinkling lights, reflective ornaments, the ropes of flashy tinsel, diamonds (ahem, are you reading this, Hot Stuff? ), and such. I love Christmas music, especially the more traditional carols and hymns perfectly harmonized and performed by choirs – I feel no shame in humming along out loud as they are pumped out of the speakers in the mall stores; I thrive on the smells of Christmas baking – sugar and cinnamon, butter and raisins, warm gingerbread – and can often be seen hanging out around the local bakery counter until the clerks get a little nervous at my continuous presence; and I take personal pride in decorating my home and yard as though it were a marker for NASA to be easily seen from outer space. My family is grown and gone and have moved away to the farthest points possible. They won’t be home to appreciate my normal decorative efforts. An early Arctic vortex unexpectedly moved across the Canadian prairies where I live and parked itself over top of my house, and as much as I want to have my yard lit up in a display that rivals a summer fireworks display, I am loathe to be out there in -25, tying strands of lights to my trees. And finally, sinking into a twinkle-deprived depression, I didn’t feel the need to haul my pre-lit tree up from the basement, rearrange the furniture to accommodate it, and transform my living spaces into a picture of perfect Yuletide-ness. I curled up in front of my fireplace with my own Grumpy Cat, Sergio, for the practical warmth of it, rather than to immerse myself in the contentment of the holiday season. Sergio: Anyone ready for a cuddle with me by the fire? Christmas was creeping up on me and I had not done any preparation, including getting my own writing ready for a Christmas push. I avoided visiting the mall and the bakery, and my playlist was a jumble of Country rock and techno. Hot Stuff’s side of the family phoned to say they would be coming to stay the entire Christmas WEEK with us for the first time ever. The parents, their two grown children, and … their two Border collies. Now don’t get me wrong. I love these relatives. They are FUN people with deadly senses of humor and the week with them will be non-stop entertainment with plenty of culinary pleasures, liquid refreshments, and laughter. 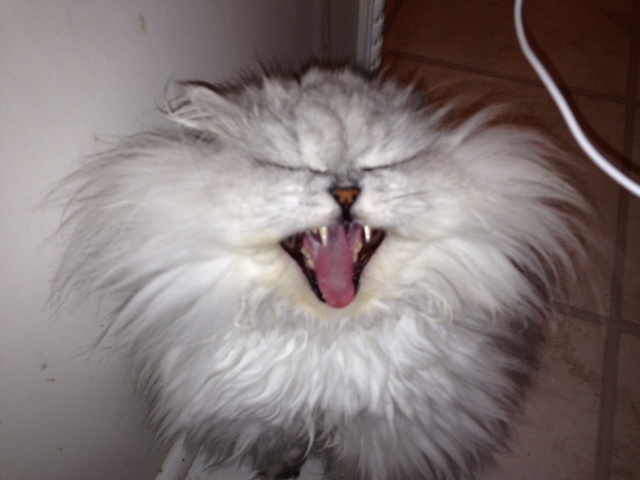 I was delighted to hear they were coming, although the news that there would be two hyperactive dogs in my house for the entire week left me a little less joyful (but believe me, I am not as distressed about that news as is Grumpy Cat Sergio…). I may have permanently injured my Achilles tendon hauling that damned tree up from the basement in such a hurry, but no worries. It’s a small price to pay for having rediscovered my Christmas spirit. The busy preparation is done and I have only to sit at my laptop, rear glued to a chair, nostrils filled with the sweet scent of fresh cinnamon sticky buns baking in my oven, and get to work on my next manuscript in my Quintspinner series. Too late for Christmas sales, but maybe for the post-Christmas slump in late January when there is not so much competition? I’m sure I read a post somewhere claiming that there is such a thing. And I think my Christmas spirit may be infectious. Hot Stuff Hubby has mentioned that the tree does look kinda empty, that maybe we should go shopping, and oh-by-the-way did I know that there are a couple of neighbors who will be spending Christmas alone – do we have room at the table for a few more? I love Christmas. Best wishes to all of you. May you be filled with the feelings of joy and friendship that is Christmas, however you see it. And in case you need a cheap-like-borsch last minute gift for a loved one, well there you go. Hit that link. ← Blog – Adventure #3 – Is that a Snake you’re wearing? Dianne! You are so funny and a little bit inspiring. I adore Sergio! Thanks Babz! By now, Hot Stuff Hubby and I have gathered quite a crew to share our Christmas day with. I’m looking for that last expansion piece in my dining room table… Cheers! This reminds me that above all we need other people at Christmas time. Loved ones-friends, family and neighbors to make it joyful. We escaped that polar vortex you mentioned and are basking in south Texas sunshine, but make sure that Christmas follows us. My own Hot Stuff Hubby is installing exterior lights as I giggle over your blog. Love your humour. Merry Christmas! Wine and other assorted Xmas spirits aid in Achilles tendon injury recovery (so I am told)! Merry Xmas! Thanks for that most excellent advice, Shirley. I put it into use and felt better almost immediately! Christmas cheers to you! Lois, thanks for dropping by! Yes, I seem to be an adventure-magnet! Best to see the silver lining in it all. Best wishes to you and your family! An enjoyable and entertaining read, Dianne, with just the right touch of humour and “drama”. I ‘m sure Sergio will delve into his bag of tricks to dig out just the right cat tools and talents to survive the infestation of canines and find a way to enjoy Christmas. You too! You always have an interesting turn of phrase. I love Christmas but I’m not feeling it down here in the south. Plastic snowmen on green lawns just don’t do it for me. Hey Lindsay! Thanks for stopping by. I know what you mean – Christmas doesn’t feel the same without the snow and crunch under one’s feet. ( Sand between your toes doesn’t count!) Have a wonderful holiday season! 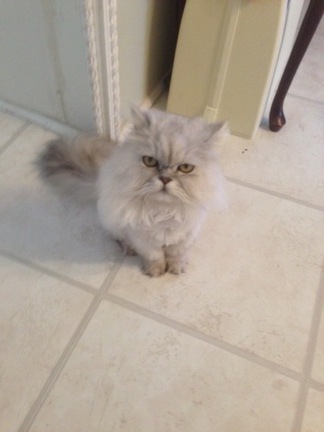 Love the grumpy cat pics! I have enjoyed doing this blog hop with you and have the Quintspinner series on my to-read list. Happy holidays! Sarah, thanks so much for dropping by. This tour has been fun. Hope your holiday is relaxing and enjoyable for you! Cheers! Great post with a good dose of holiday humor. Thanks so much. I enjoyed being a part of the blog tour with you. Thanks Jamie! I certainly enjoyed being part of this tour as well. Have a wonderful holiday!